Clearly with a week having passed since touchdown, my farewell to the space shuttle program is grossly overdue. I actually missed watching the event live, as I was off on a camping trip in some beautiful New Hampshire woods. Atop of the usual excuses, it's been a bit hard to figure out what I could write that was different than so much that has been written. It would seem that every major media outlet opined on the subject, and most did a decent job in hitting the key points. The shuttle was borne of a grand vision, but that vision was shorn grossly by the Nixon administration. Reusability never achieved the cost savings once envisioned, but the requirement for saving the engines coupled to insufficient funding forced the shuttle-astride-tank configuration. That configuration contributed to both fatal shuttle losses. The main engines became huge weights to be hauled to orbit and back, reducing payload, yet required essentially complete rebuilding after each launch. What was left out of most analyses I saw were some of the other design issues. 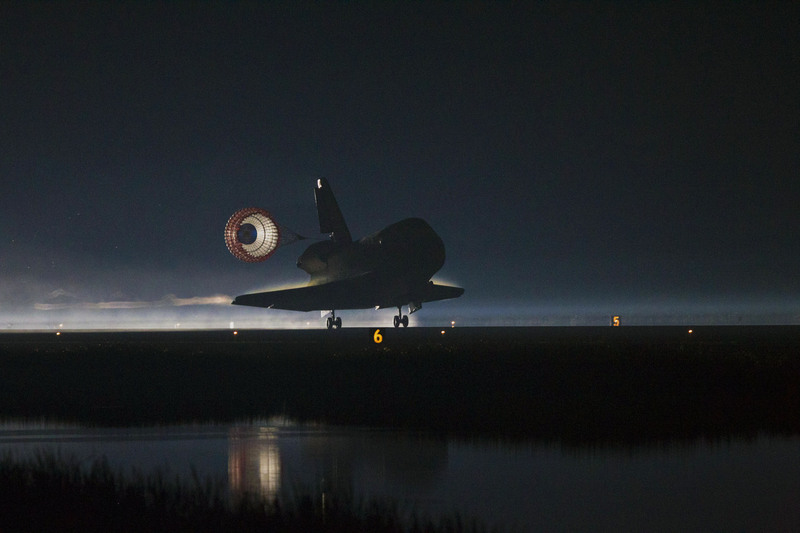 The shuttle program was built around a complex set of requirements engendered by various roles and customers. In particular, the U.S. Air Force wanted a vehicle with great cross-range capability, the ability to choose a landing strip rather than have that choice completely forced by the orbital trajectory. This decision led to a much more plane-like design, rather than a stubby lifting body. This again led to a more fragile design, though whether a lifting body could have survived the foam strike that doomed Columbia is purely a matter of speculation. The Air Force quickly decided the shuttle did not meet their needs, meaning all that complexity was never really used to full advantage. Despite all this, it is important to remember the amazement that the shuttles brought. All that complexity was an operational nightmare, but a technological wonder. The ability to repair and retrieve satellites was not often used, but was used well. In particular, the missions to fix and then extend the life of the Hubble Telescope yielded enormous scientific dividends. In an ideal world, the shuttle would have been a technology demonstrator, an X-plane. We would have learned a lot of design lessons, narrowed the field of key tasks and moved on to new designs. But political pressures and funding limits meant that the shuttle would be the basket into which all of the U.S.'s launch eggs would be thrown, and when that didn't work out we were left with an expensive system that performed none of its remaining tasks economically. As a government agency, and particularly as a very expensive one, NASA cannot help but be subject to political winds. The early politics of the space program could still be seen in the final launch, with control of a complex and dangerous operation transferred at a critical point between two control teams separated by hundreds of miles. Thanks LBJ! As a kid I once thought that flying in space would be a good edge to getting into the U.S. Senate; it never occurred to me that the converse would hold true. In the end, I was surprised how few valedictories remarked that this final flight was largely a creation of the the Texas and Florida congressional delegations. Those same delegations have also in recent times ensured that over $1 billion was spent on the Aries rocket after its cancellation; the space program is more a jobs and votes program than anything else to that crowd. That calculus will change greatly with the shuttle's closure. Tens of thousands of persons have unfortunately lost their jobs, though it is the fact that so many worked on each shuttle launch that pushed their price tag so high. Indeed, few of the commentators moaning about the U.S. being forced to hire Russian taxis to the International Space Station have noted the nearly 20-fold difference in cost. Even allowing for the greater capacity of the shuttle, the lower cost and high reliability of the Soyuz system make it a far better baseline method for getting to the station. Personally, I believe I have seen the last NASA-designed, NASA-commissioned spacecraft designed for low Earth orbit. The future there belongs to entrepreneurs. Indeed, it appears that SpaceX's Dragon capsule may dock with the station this year, and Virgin Galactic will probably start offering suborbital joyrides next year. I am not optimistic that the NASA will get to send humans again beyond low earth orbit; our country no longer has the collective will and attention span required for such a long endeavour. Each president wishes to have their own program, abandoning their predecessor's and leading to a treadmill of stalled concepts. And nobody wants to write the checks. As for the shuttle, all that remains now is to await the emplacement of each craft in their final museums. Then I can plan my pilgrimages to each one, to savor the wonder and joy again. They will all be special, though Atlantis will always occupy a particular place in my heart, since it is headed for the hallowed ground of the Cape -- but also because it is the only one I watched head skyward.